« Mister Freedom® CONDUCTOR Jacket, “cachou” Duck Canvas, Sportsman Catalog mfsc Fall 2018, Made in USA. The Classic Fits of the Mister Freedom® “CALIFORNIAN” Blue Jeans. Mister Freedom® “CALIFORNIAN” Blue Jeans. Our popular classic five-pocket jeans are called “Californian” because they are made in California, USA. 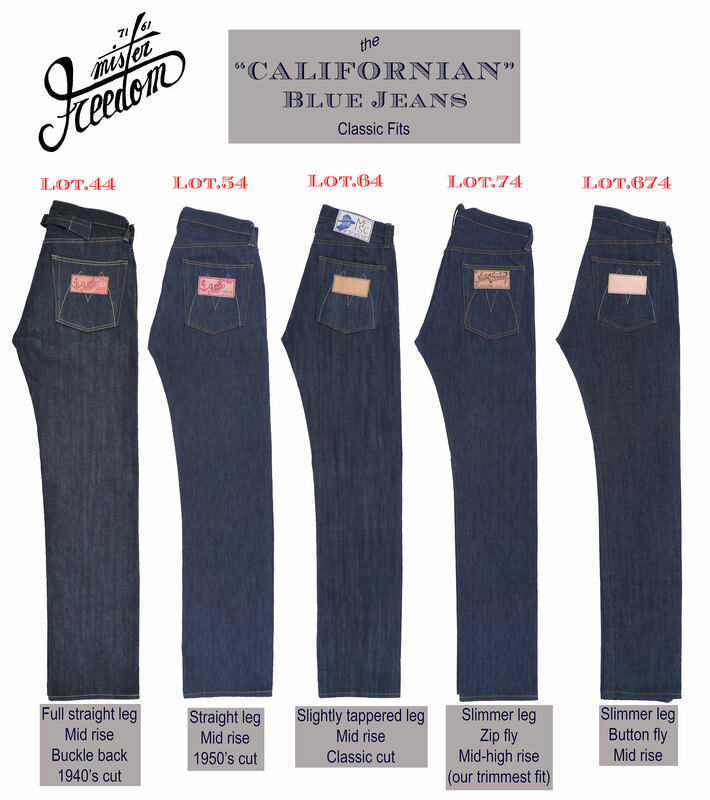 The MF® Californians come in five timeless basic cuts rounded-up by main Lot numbers: Lot.44, Lot.54, Lot.64, Lot.74 and Lot.674. * Californian Lot.54 (Yellow paper flasher, 2010): The original issue, straight leg, button fly, classic 1950’s silhouette. Issued in 12.5 Oz. NOS Cone indigo denim. * Californian Lot.44 (Box packaging, 2011): Similar pattern, buckle back added, straight leg, button fly, classic 40’s-1950’s silhouette. Issued in about 37 types of NOS denim twills. * Californian Lot.44R (Reissue, w/o packaging, 2018): Same as Lot.44 but issued in NOS Cone 13.Oz sanforized denim twill. * Californian Lot.64 (Red paper flasher, 2013): Straight leg, slightly tapered, button fly, classic 1960’s vibe. Originally issued in 13 3/4 Oz. indigo denim (SC1966). * Californian Lot.64US (Army green paper flasher, 2014): “Uncle Sam” edition. Straight leg, slightly tapered, button fly, classic 1960’s vibe. Issued in 13 3/4 Oz. indigo denim (SC1966). * Californian Lot.64OK (Orange paper flasher, 2014): “Okinawa Advisor” edition. Straight leg, slightly tapered, button fly, classic 1960’s vibe. Issued in 14 Oz. “Okinawa 301” indigo denim. * Californian Lot.74 (Aqua green paper flasher, 2015): Tapered, our slimmest leg, zipper fly, classic “1960’s youth” vibe. Originally issued in 12.5 Oz. NOS Cone indigo denim, then in NOS 12.5 Oz. wheat denim. * Californian Lot.654 (Yellow paper flasher, 2015): Pattern and fit of our classic Lot.64, button fly, with the bells and whistles of our original Lot.54. Issued in NOS 12 Oz. Cone indigo denim. * Californian Lot.64E (Red/White stripe paper flasher, 2016): Special “US Presidential Election” Edition. Straight leg, slightly tapered, button fly, classic 1960’s vibe. Issued in 16.5 Oz. NOS Cone indigo denim. * Californian Lot.674 (Ivory white paper flasher, 2017): Top block of the Lot.64 mixed with tapered leg of the Lot.74, button fly, issued in “Okinawa 301” 14 Oz. sugarcane fiber indigo denim. * Californian Lot.64BB (Dark navy paper flasher, 2017): Lot.64 with added Buckle-Back cinch, button fly, issued in “Okinawa 301” 14 Oz. sugarcane fiber indigo denim. * Californian Lot.64OG (Venice Beach Sunset paper flasher, 2018): Pattern and fit of our classic Lot.64, button fly, issued in NOS 15.5 Oz. organic Cone Mills denim. Asides from our MF® Californians, we also offer a wide range of non five-pocket denim trousers. Available from www.misterfreedom.com, our Los Angeles brick & mortar store, and fine retailers around the World. Email sales@misterfreedom.com or call 323-653-2014 with any questions unanswered above. 1 comment to The Classic Fits of the Mister Freedom® “CALIFORNIAN” Blue Jeans.